Let’s set the scene: you’ve put in the hard yards at work and are looking forward to crashing on the couch watching your favourite show. No worries! Before you left the office, you kicked the heating into gear so the lounge room is toasty for your arrival. As you walk in the door the lights come on, and you grab your iPad and with the touch of a button, your TV show is on the screen, ready to go. In a matter of minutes, you’re rugged up on the couch with a cup of tea and in comfort heaven. You think you’re dreaming right? Well it can all become a reality with the right technology! Last month, we took a look at being energy smart around the home, but this time we thought we’d show you the basics behind how you can build your very own smart home. Home automation means that you can control just about anything (yes, anything) from anywhere by using your smartphone or tablet as a long-distance remote control. From your lighting, home entertainment, security systems, home heating and cooling, you can be in control whether you’re at home, at work, or even overseas! It’s not uncommon for a modern home to have multiple devices in the same room – for example, your typical lounge may have a TV, set top box, DVD player and a surround sound system. So why not bring them all together and control them all from one place? The first step is finding a smart home automation system. Push Controls is popular on the Australian market because it allows you to streamline your devices and control everything from a single app. Turning a light switch off is pretty easy, right? Well, it can be even easier. Now you can turn the lights off in your bedroom from the lounge room without even getting off the couch. For those who are obsessed with their home lighting; check out Philips Hue. 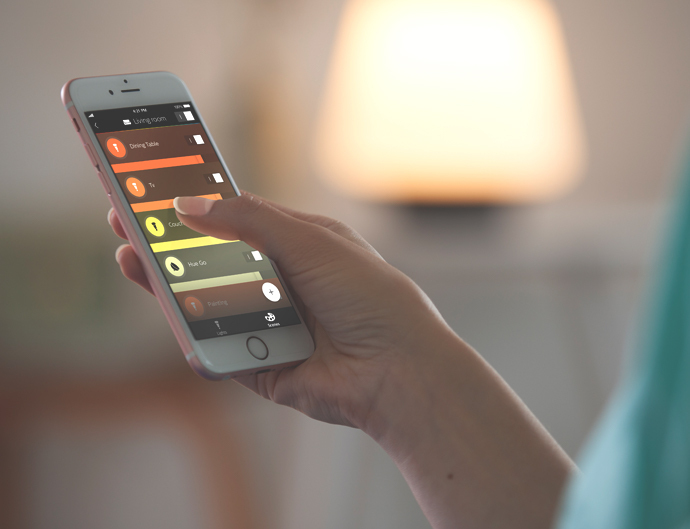 The Hue range of Smart LED bulbs allows you to connect your lighting to your smart device using the Smart wireless hub: The Bridge and manage them from the Hue App, which is available on both Apple and Android devices. For a little ambiance, you may want to give these light strips a go! You can see them in action here. 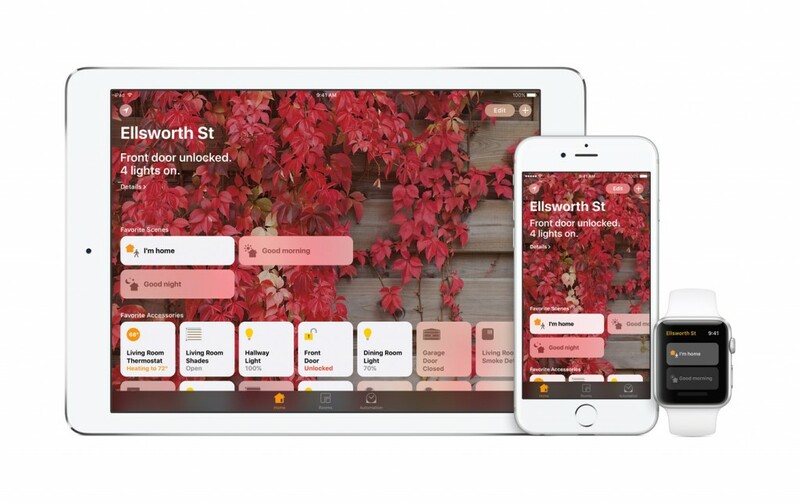 If you’re an iPad or iPhone user, Apple’s HomeKit technology may be the solution for you. This technology allows you to control connected devices with your iPhone or iPad, or even the sound of your voice! The options are endless and they’re all pretty cool! You can set up automated locks, set your lights to turn on with your alarm for the ultimate wake up call, and let your house sense when you are near with the proximity alert. Keep in mind that it’s the smart home controller that should do all the work, which means that you don’t necessarily have to have ‘smart’ appliances in your home as well. That said, it’s generally easier to have devices from the same brand as they’ll be more likely to play nicely together on the same home automation system. For example, the Apple HomeKit will require appliances that are HomeKit compatible. Before you get started on making your home smart, work out what you want to automate. You can start with just the lighting and temperature controls or you can go all-out and include your security systems and home entertainment areas as well. If you live in an apartment or split-dwelling, be sure to check the Strata rules and to see how they could impact your smart home’s installation and submit any necessary applications. When it comes to the world of home automation, it’s a good idea to speak to the professionals, especially if you’re going the whole hog and decking out your entire home. They can even help you get super serious and integrate irrigation, solar energy and pool/spa pumps. While many home automation devices are wireless and can just be plugged in to the wall outlet, some systems may be a bit more complex. If you’re going to do the plan yourself and you need wiring to be installed, it’s important to remember to leave it to the pros. In Aus, a licensed electrician must complete the installation and in all honesty it’s just safer that way! With tech constantly changing, there may be a few people out there who’ll want to upgrade regularly. If you’re sticking with the same brands each time you update, you may not have any issues but it’s still a good idea to speak to your installer about what changes can stop your system from working seamlessly. If an update is required, they’ll be your go-to for a fix, so be sure to keep yourself in their good books! Is your home ‘smart’? Tell us about your home automation setup in the comments! Hi. I recently bought a WeMo starter kit from Bunnings. After two days of trying to get it to work – without success – I discovered on Belkin’s support pages that Belkin had stopped production and, once all had been sold, the product was going to be discontinued. I took mine back to Bunnings for a full refund. Moving on to the Philips Hue products – hopefully with more success! Thanks for the heads up! I have updated the article and removed WeMo from the content to prevent confusion. I hope you are successful with the Philips Hue range – be sure to let us know how you go! be careful with WeMo products I got caught like I guess 1,000’s of others by buying WeMo’s starter kit (2 x bulbs and 1 x link) WeMo/Belkin is no longer manufacturing them, leaving people like me in the lurch as to connecting future products to it. It also raises the question of future security issues as well. I purchased mine from Kogan and they are refusing to offer a refund even though they know WeMo is dumping this product on the market. More reputable companies, unlike Kogan are warning people that the product is discontinued by the manufacturer. Here is a link to Amazon, scroll down and you will see the warning. Thanks for the heads up with WeMo products – I have updated the article and removed this from the content to prevent confusion. My home is very intelligently set up – absolutely NOTHING is connected to the internet except the modem (and two computers); this includes all phones and tablets. Your article makes a lot of big claims, e.g. “you can control just about anything (yes, anything) from anywhere by using your smartphone” but doesn’t say how. I’ve followed the links in your article but they still don’t explain. How can I turn my oven on remotely if it’s not a ‘smart’ oven? How can I turn my heating/cooling on remotely if it’s not a ‘smart’ system? Your article says you don’t have to have smart appliances… but then doesn’t back this up. Please can you explain how? Apple HomeKit doesn’t have any info on this – the best it can do is monitor air quality. PUSH can’t do this (or if it can, doesn’t say so). I’d like to know HOW. Thank you. For appliances that aren’t already ‘smart’ you can use Smart Plugs that work with Wi-Fi to turn the appliances on and off from your device. In the Apple HomeKit range there is the Elgato Eve Energy, alternatively D-Link have a range available that you may like to check out here: https://www.dlink.com.au/home-solutions/connected-home/wi-fi-smart-plugs, however there are a number of other brands and products on the market as well. Unfortunately, not all appliances will be able to be ‘smart’ however when looking to update look into products that will allow integration into your home. Why would anyone want to turn their oven on when they are not home to keep an eye on it? Recall the (recalled) Samsung washing machines! When houses started burning down, I moved mine outside to a safe location until Samsung sent me the refund and took the unit away. I saw the Wemo on two shows – Better homes and Gardens as well as Selling Houses Australia. Checked with Bunnings who said they had everything, downloaded the app and then went to Bunnings to buy the products and after lots of talking to more than one person found out going to be discontinued. Then tried to sell me something else being discontinued. We dont even get nbn until 2020 so tell us some good news for a change!!!! Wemo works great for me, I use with IFTTT. It’s one of the better smart accessory lines out there. I am using CBus wiring and will have lights, doors, security, aircon and AV automated from my phone or IPad. I can also open doors from anywhere in the world where I have wifi. I like the “Anonymous” response where Intelligence is substituted for Smart. For me computers and phones on the net – yes. Other stuff – forget it. That’s enough. Surely we can wait a few minutes for the heating to kick in and get up off the couch to close the blind or switch off the light. Everything connected is a ridiculous scenario that is just technology for technology’s sake. So much Smart stuff in my house is not even used. I utilise a professionally installed home automation system called Control4. It provides HVAC control, Shading control, Audio/Video based control, Security integration which includes cameras, door locks, security systems. and more. The most attractive thing about home automation isn’t that you have control via a single application on your smart phone or tablet but it’s the automation that occurs when the system detects things like occupancy, changes in the environment and other smart things like google home or Amazon echo based voice control. You still have FAILED to reply to my question of when the NBN will be connected to my home. Why do you refuse to tell me, yet keep advertising that it will happen? As a reasonably tech-savvy person I think some of the frustration with home automation in Australia is that most people are aware of the technology easily available in the USA, and what it costs over there. Then when you look at what is easy to get in Australia you realise you are getting fewer choices, lower tech and higher prices. We are a little way behind in my opinion. Is there a problem with automatic lighting using Wi Fi as the Belkin Wemo is discontinued and I think Osram is the same? The first time I had an experience turning of my home a smart home is with the Smart lighting.I have the Philip smart lighting set installed in the hall of my house,and they turn on-off as and when i enter or leave house. Now planning to make on setting up my whole home where I can control it from my phone.